Though he made a brief cameo appearance in Wreck-It Ralph, it looks like Sonic the Hedgehog will now star front and center in his own feature film. The live-action/CG hybrid will be the first in an expected film franchise, with the plan being to release one new movie each year. Sony and producer Neal H. Moritz are teaming up with Japan-based animation film production company Marza Animation Planet to tackle the famous video game speedster. Screenwriters Evan Susser and Van Robichaux, alumni of Upright Citizens Brigade, will draft the screenplay that’s expected to include the world’s fastest hedgehog and his infamous foe, the evil Dr. Eggman. Hit the jump for more. Heat Vision reports that Sony and Sega will team up to adapt the $1 billion franchise, Sonic the Hedgehog, for a feature film franchise. 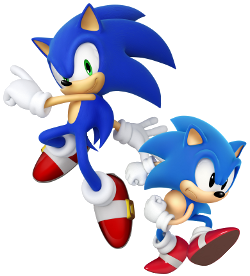 The heroic hedgehog appeared in 1991 on the Sega Genesis in his very own video game, but it didn’t take long to spawn numerous sequels, comic books, and a host of animated series; there’s even a new one in the works called Sonic Boom that’s destined for Cartoon Network. So it’s a little surprising that we’ve gone over 20 years without seeing Sonic on the big screen in a feature film. Perhaps the time and technology are finally right for studios to take a chance on this one. Remember, kids, it’s not just Sonic in the game anymore, even though his name remains at the core of the franchise. It also includes plenty of other marketable characters like Miles “Tails” Prower, Knuckles the Echidna, and even Shadow the Hedgehog, so expect this one to be around for quite a while.